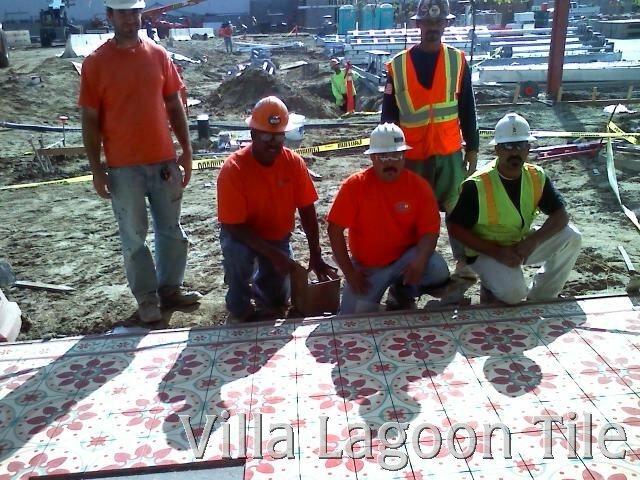 Villa Lagoon Tile is very proud to have been chosen to reproduce a cement tile for an important California landmark. The former Ambassador Hotel has been locked in controversy for 20 years and the City of Los Angeles is now moving forward to complete a municipal educational facility, The Central Learning Center, on this prominent city property. 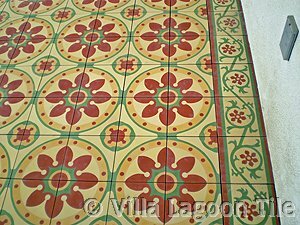 So much had gone into the final decisions on what to do with this property and so many people were involved, it was very important to get approvals all along the way and to be sure the original cement tiles were reproduced as accurately as possible. 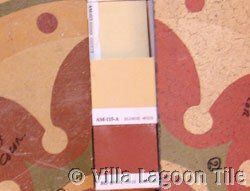 The first step is to identify the best color choices for the new tile to be made as close as possible to the 80 year old originals. 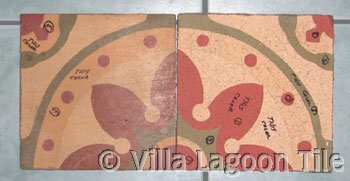 The samples of the original 8 inch by 8 inch tile that we received had been made by two different companies. The goal was to pull some color from one version of the tile and other colors from the second tile. Both tiles showed significant wear and deterioration from neglect. 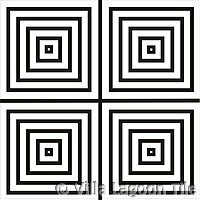 We aligned our current color chips with the portions of the tile that had the desirable colors. Several people were involved in the color matching decisions. 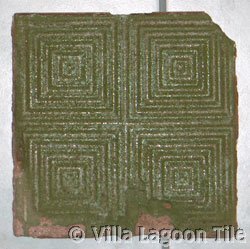 We could see that the green used in the solid relief tile was slightly different from the green in the mosaic patterned tile. A decision had to be made about which green to match. 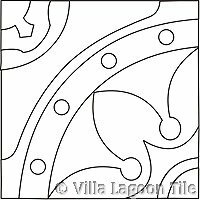 Line drawings of the original patterns are then given to the mold maker to reproduce cement tile mold inserts for each component of the field tiles and border tiles. 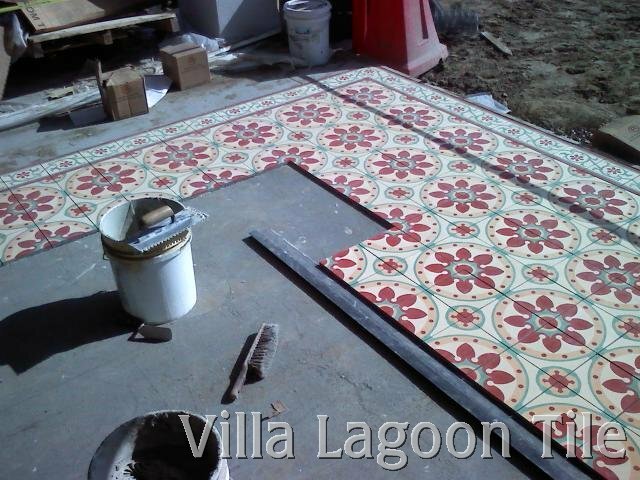 We were considering the possibility of making several molds since this tile installation originally utilized two different border tile and two different corner tile patterns in addition to the central motif. There is also a relief paver tile. It will be up to the architects and historical committee representatives to decide if both versions of the border and corners need to be reproduced. 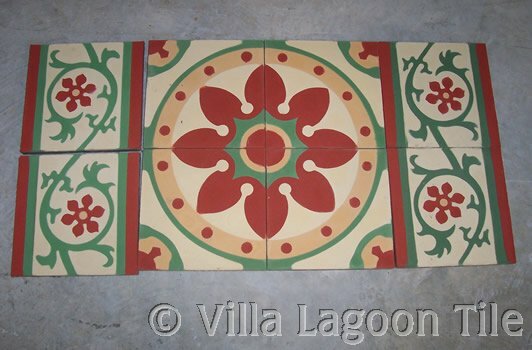 These are our finished reproductions of the original Cuban tiles. Our cleints said they looked too new. We told them that the originals had 80 years of weather, wear and tear. 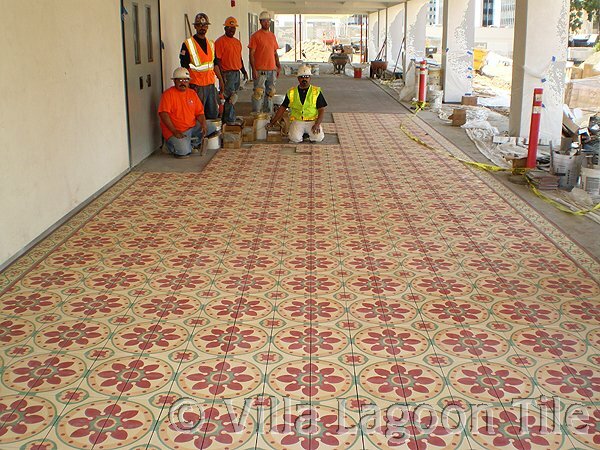 We could try to help them do a faux aging treatment but it is very likely that this is what their tiles originally looked like. 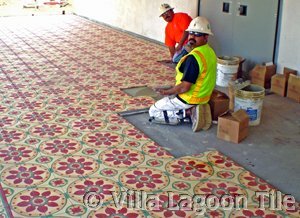 The pool was surrounded by matching solid color cement tile. The Central Learning Center campus will also feature a new public park along Wilshire Boulevard honoring Robert F. Kennedy who was tragically assassinated at the Ambassador Hotel originally on this site.